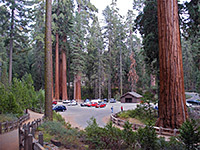 The western section of Kings Canyon National Park (Grant Grove) has rather more day hikes than the main area along the Kings River, since the hills hereabouts are not so steep and the surrounding forest is crossed by a network of old logging tracks that now make for good trails. Most routes lead to groves of giant sequoia trees though a few (Big Baldy, Buena Vista Peak, Park Ridge) reach high elevation viewpoints. The Grant Grove Map shows the location of each trail. 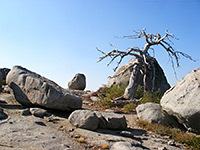 See also the listing of trails for Kings Canyon, and the nearby Sequoia National Park. Azalea 2 900 South of the private enclave of Wilsonia, the Azalea Trail links CA 180 with Park Ridge; quite a steep ascent through mixed sequoia-pine forest along upper Sequoia Creek, which is flanked by many ferns and azaleas, the latter in bloom during midsummer. Big Baldy 2.2 650 8 miles from Grant Grove at the east edge of the national park, the route to the granite summit of 8,209 foot Big Baldy is along a well marked trail through pine forest interspersed by open areas. Views from the top encompass densely-forested Redwood Canyon to the west, Little Baldy to the south, and many higher peaks to the east, around the Jennie Lakes Wilderness Area and beyond. Big Stump 2 (loop) 200 Starting from the Big Stump entrance station on CA 180, this easy trail loops through a basin that was extensively logged in the 1880s but is now recovering after being added to the park in 1958 and so protected from any more commercial activity. 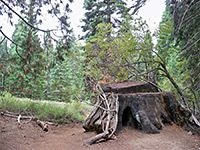 Several short spur paths lead to particular stumps and fallen trees bearing evocative names such as Sawed Tree, Burnt Monarch and Shattered Giant. Buena Vista Peak 0.8 420 This faint trail leads from a small parking area a little way south of Kings Canyon Overlook, on the Generals Highway southeast of the main Grant Grove area, to a treeless, granite summit that has a 360° view over the surrounding forest, mountains and canyons. Converse Basin 1 520 A few miles north of Grant Grove, in the new Giant Sequoia National Monument, Converse Basin once contained the most extensive grove of sequoias anywhere in the Sierras but was almost completely cleared in the early 20th century. A network of dirt tracks criss-crosses the basin, and from one begins a shady trail to Boole Tree, one of the few remaining old-growth sequoias, and today recognized as the 8th largest in the world. Amongst the new pine trees are many huge stumps from the felled sequoias. General Grant Tree 1/3 (loop) 30 The paved, wheelchair accessible, self-guiding path to General Grant, the 3rd largest tree on Earth, begins 1 mile northwest of the Grant Grove visitor center, and also passes numerous other large trees with official names. This is the one must-do trail in Grant Grove if time is limited. North Grove Loop 1.5 (loop) 300 North Grove is a group of trees in a less-visited part of the forest, on a west-facing hillside above a tributary of Mill Flat Creek. The sequoias here are mixed with pine trees, meadows and small streams, and are visited by an easy trail along an old logging track. The starting point is at the end of the short side road also used for the General Grant Tree trail. Park Ridge 2.3 200 Beginning at the end of the paved, 2.3 mile side road to Panoramic Point, this trail follows Park Ridge southwards, ending at a fire lookout point at 7,530 feet. 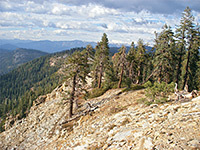 The trees are regular pine and fir, but the attraction of the hike is the panoramic view in all directions. 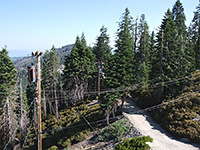 A forest road provides an alternative route back to the trailhead. Redwood Canyon 16 1,400 Two loops and a spur trail lead into the steep-sided valley of Redwood Creek, the only part of the Grant Grove area suitable for backpacking, though only for a maximum stay of 2 nights. Despite the name, the canyon contains sequoias rather than redwoods, mixed with other trees, open meadows and small creeks. Sequoia Lake Overlook/Dead Giant 2.2 200 From the General Grant Tree parking area, the Sequoia Lake Overlook trail heads southwest, descending gradually through the forest to an overlook of the lake, located just west of the national park boundary on private land. On the way the path passes the remains of a large sequoia that was felled many years ago. Sunset 3 1,140 The Sunset Trail starts from the Grant Grove visitor center and heads west into the forest, winding down the hillside above Sequoia Creek as far as the national park boundary, just east of Sequoia Lake. En route are a wide variety of plant species, including sequoias on the upper slopes, and a small waterfall along the creek (Ella Falls).